There’s no doubt that Petite Anse is one of the most romantic hotels for Grenada weddings on the island. It’s for that reason that many of our guests come to stay with us to get married, for their honeymoon or to enjoy quality time spent with their significant other. We offer a range of Grenada wedding packages and honeymoon packages. Otherwise you may just want to stay in our honeymoon suite or in a beachfront cottage. Imagine getting married on a palmtree studded beach with the turquoise waters behind you stretching all the way to the Grenadines. Your photos will show palm trees and distant isles. The reception would be in a gourmet restaurant overlooking the stunning wild beach at Petite Anse. 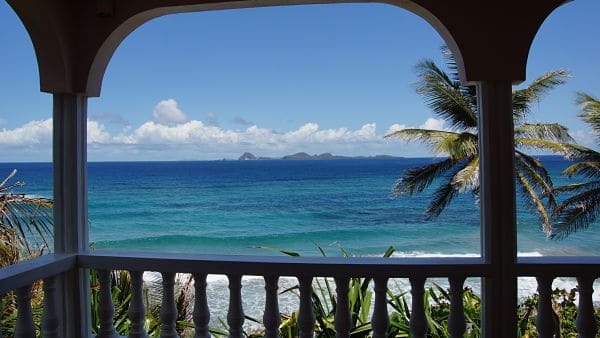 The reception would be in a gourmet restaurant overlooking the stunning wild beach at Petite Anse. Surrounded by your friends and family or even just as a couple – this will be one of the most special days of your life. Petite Anse has been used as the venue for many weddings. We’ve gained experience and knowledge about how to deliver a romantic day for the marrying couple (check our TripAdvisor reviews). In fact, we were even voted as one of the most romantic hotels in the Caribbean by TripAdvisor users. We will go all out to provide you with your special requests and will do all that it takes to ensure that your day is both romantic and memorable. We can arrange hairstylists, photographers, flowers and of course the wedding itself. If you need to discuss your plans or you would like to know what might be possible for your wedding, then please do let us know and we can arrange an exploratory discussion. Sworn Affidavit attesting that neither party has not been married previously. Decree Absolute, for each divorced party. If widowed, the deceased’s Death Certificate. Legal proof if a name was changed by Deed Poll. If under the age of 21, written parental consent by way of an Affidavit. If originals are in another language, they must be translated into English and certified. The cost of a marriage in Grenada is very reasonable and legal documents are usually in the region of less than EC$50. We have put a few sample Grenada wedding packages together for you. You can view them here. Otherwise, if you’re looking for a bespoke arrangement, then you can contact us here. If you are looking for a honeymoon, visit our Grenada honeymoons page or you can reserve one of our rooms for a romantic break here. Contact us today to arrange your wedding in paradise +1473 442 5252.